Bob Patrick started doing metal work for a living as a restoration blacksmith in 1967. He originally worked at Hale Farm and Village in Bath, Ohio, a restored village. 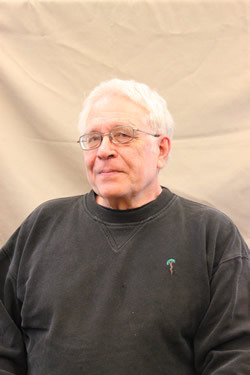 Patrick attended Kent State University, and in 1971 he began teaching blacksmithing there under famed goldsmith, Mary Ann Scherr. In 1975, he moved to the Missouri Ozarks, and later landed in NE Missouri. He participated in shows at the Craft Alliance Gallery in University City, MO, and at the University of Missouri- Columbia, along with other places. Patrick ran his own blacksmith school, taught at various craft schools, and was a demonstrator and teacher at regional and national blacksmithing conferences in the USA from the mid 1980’s on. He received the Alex Bealer Award, the top national award for Artist Blacksmiths in 2002. Patrick mostly works in forgeable and castable metals, specializing in mild and tool steels. He resides in the Arkansas Ozarks with wife and fellow artist Mary.